This power-packed program contains some of the best marketing and sales ideas ever discovered. The Internet is rife with free offers. This one's real but expires on Nov 30, 2009, which may be based on New Zealand time. So act now. The Brain Alchemy Masterclass teaches you how to get, keep and grow clients. You get an audio recording of a live three day seminar with notes. The regular price is $2,500 US. Ouch! That's what I wondered too. Since I read the Psychotactics blog from Sean D'Souza, I was confident the content would be good. That shows how well blogging establishes credibility. Plus, Sean has an engaging sense of humour. Some ideas may be new to you or reminders. Either way, you'll benefit. The attendees actively participate. This makes the sessions much more engaging and valuable than listening to Sean alone. 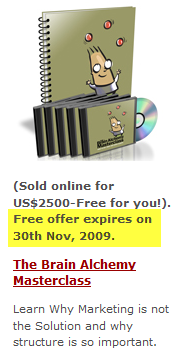 Even for free, is The Brain Alchemy Masterclass worth your time? Yes. The beginning is dull. You get the normal self-promotion telling you how good the course is. This is as annoying as the commercials at the movie theatre or the movie trailers at the start of a DVD. Feel free to zip past the boring bits. Sean writes in an engaging, entertaining way. I never heard him before and did not care for his voice. You may feel the same about my podcasts for Riscario Insider. I continued listening. Either Sean got better or I got more comfortable with him. Or both. When can you find time to listen to the course? Worry about that later. Stop. Download the course. Then continue reading this post. We find time for things that matter to us. We also make time for things we're forced to do (like tax returns). I cheated. Since many of the ideas were familiar, I listened and made short notes while spending two days cleaning up my office. You'll get better results by listening more intently and over a longer period. If you're reading this post after the free offer has ended, don't despair. You can pick up many ideas by reading the Psychotactics blog. Maybe the free offer will be repeated. Back By Popular Demand.